← Writers, we have lift-off! Now that you’ve all had a week and a half to play with Protagonize 2.0, I figured it’s time to start posting some introductory overviews and walkthroughs of the new features you may or may not have noticed in your initial experiences with the new site. Today, we’ll take a brief look at a revamped feature from the old site: Page Markers, which have changed a lot from what most of you were familiar with previously. Your experience with Page Markers on the old site was probably quite one-sided. First off, the “Add Marker” button was buried at the bottom of pages, visually tiny, and the intended functionality was not particularly obvious to new or casual Protagonize users. As you can see from the screenshot above, adding a page marker on the new Protagonize is a much simpler, cleaner and more obvious process. Taking a page (pun intended) from e-readers and reading apps like the Kindle or Apple iBooks, we’ve introduced a visual page marker at the top right corner of every work page on the site. The new marker is placed at the top of the page — more logical if you haven’t read it yet — and finger-friendly, as well, making it much more convenient for tablet or other touch-screen readers. 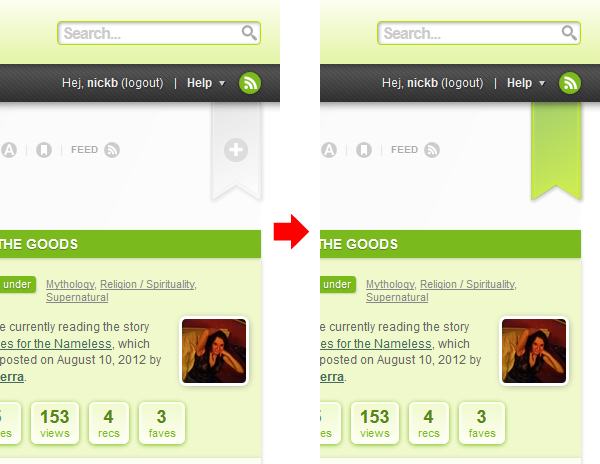 To add a new page marker, simply click the “unmarked” marker; to remove it, just click it again. Super simple. In addition to the new page marking system, there’s an improved way of keeping track of multiple markers you may have in a story, poem, exercise or other work. The new pop-up marker menu gives you quick access to all page markers you may have in the work you’re currently reading, so you can jump back to any spot in the story that you left off at, any time. Markers in the menu are sorted from newest to oldest, so your latest marker will always be at the top of the list. Markers tie into another entirely new feature, too: the Reading List. When you add a page marker, not only does it show up on your reading list under Markers, it shows up on the reading lists of authors who follow you, so they can see what you’re reading or interested in. 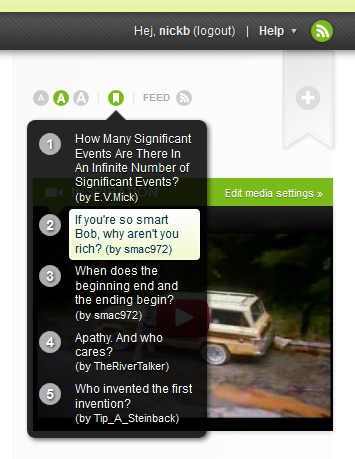 In the next day or two, we’ll discuss the new Reading List feature in-depth. Stay tuned! This entry was posted in General, Site mechanics, Tutorials & Walkthroughs and tagged Features, markers, overview, page markers, protagonize 2.0, redesign, walkthrough. Bookmark the permalink.